Description: Design and construction documentation for a 4.5-star hotel and spa. As a member of the Leading Small Hotels of the World, The Umstead Hotel is located minutes from downtown Raliegh, North Carolina. 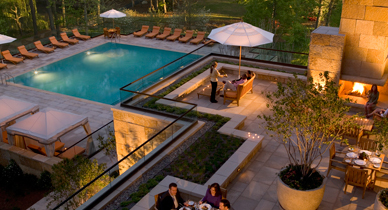 This 150 key hotel is situated in the Piedmont Region (roughly translated as ‘foothills’ in French) of North Carolina. This area is densely vegetated and is an in area with an appreciation for the arts and nature. The design concept revolved around immersing the hotel and spa in the existing vegetation, preserving the mature trees when possible. In addition to the program design of the hotel and spa, the design integrated a tranquil, romantic multi-use trail that often hosts equestrians. Eric Lennox was a designer on this project while at EDAW.